1898-O VAM-16 I2R3: Date set Normal, High, and Slightly Slanted (NA). Second 8 Doubled at Floor Upper loop. 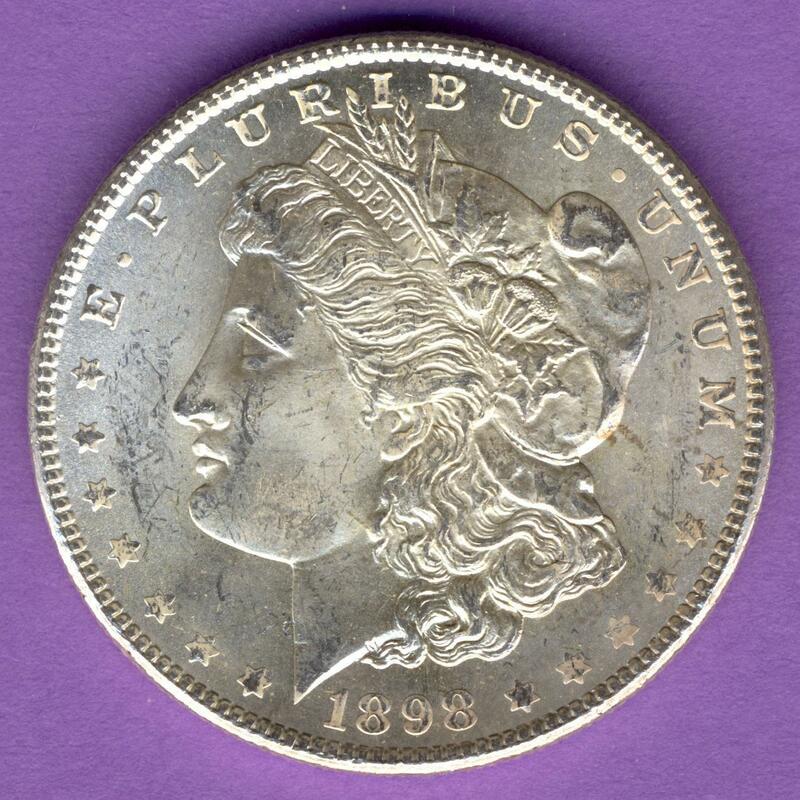 Mint Mark Set Center, High, and Upright. Rotated Die 12 deg. 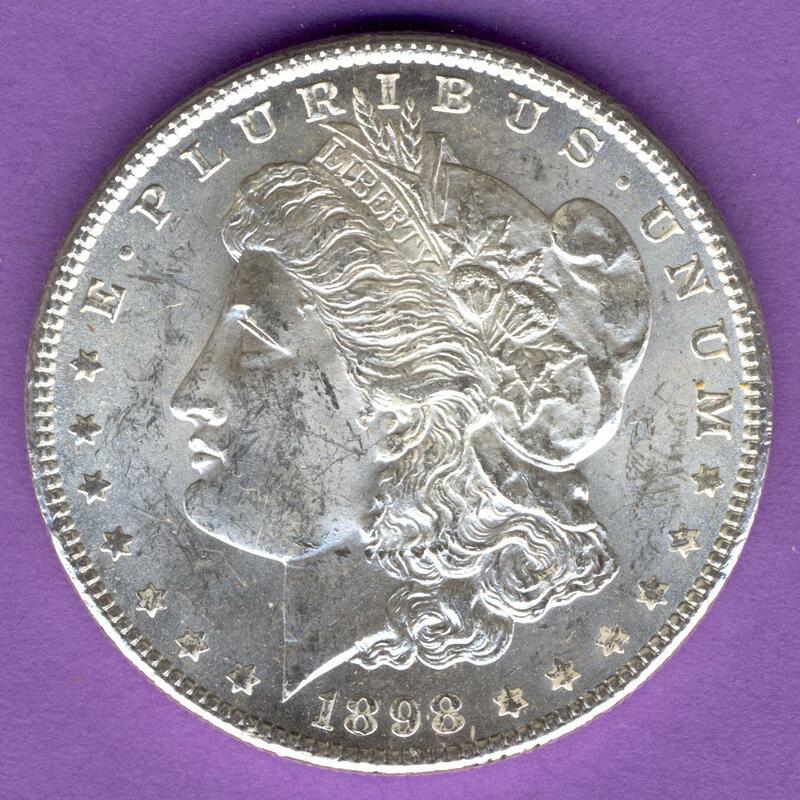 Obverse: Attributes - Date set 2.5 Denticles from the Bust Point, High, and Slightly Slanted (NA). Doubled second 8 at upper inside of lower loop (NA). Markers - Gouge between center wheat leaf and right grain. Diagonal line in left side of the forehead hair gap. Diagonal and horizontal lines near floor of wheat cotton leaf gap. Orthogonal lines cross the tops of E and T of LIBERTY. Diagonal line in the foot of the I of LIBERTY. Concentric lines cross the cotton boll stems and husks. Three lines in the Base V of the third cotton leaf. Diagonal line at rear inside of nostril. Two chips in the upper 1/3 of the D-void. Line near floor of D-void. Horizontal line crosses center of hair swirl. Heavy line at the apex of the left hair V. Heavy line in the valley of the right hair V. Flat right stars. Crack from the 1 to the first left star crosses the bust point with a jog. Crack crosses near the base of 98 and the first two right stars. Diagonal cracks pass through the fourth and fifth right stars. Crack connects from the top of the M to the sixth right star. Crack passes from the first right star across the field to cross near the apex of the lower hair and then out onto the field near the fourth and fifth right stars. 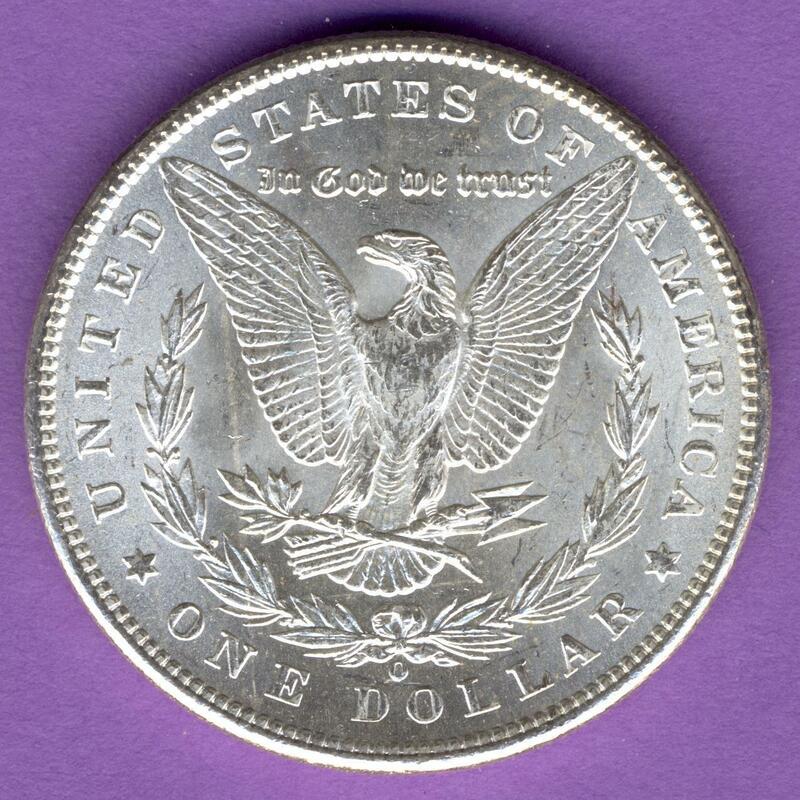 Reverse: Attributes - Mint Mark Set Center, High, and Upright. Markers - Gouge off upper right serif of r and closed lower loop or s of trust. Horizontal line through pupil. Parallel lines fill left wing gap. Two parallel lines extend from neck feather near floor of left wing gap. Line extends from left leg feather to third transverse upper tail feather and another horizontal line to the eighth transverse upper tail feather. Horizontal lines extend from along the right leg to the seventh upper tail feather. Two horizontal lines extend from the left leg to the first upper tail feather. Dense horizontal lines in the right and left leg triangles. Horizontal line crosses upper 1/3 of inside bow loop and another short horizontal line crosses the floor of the inside bow loop. Lines cross from the right outside bow loop and the bow ribbon to the fifth right wreath cluster. Interrupted crescent shaped pitting in the inside mint mark loop (O/O). Beveled field along the upper arrow feather. Lines between the olive leaf clusters. Polishing of the bases of the middle lower outside feathers of the right wing. 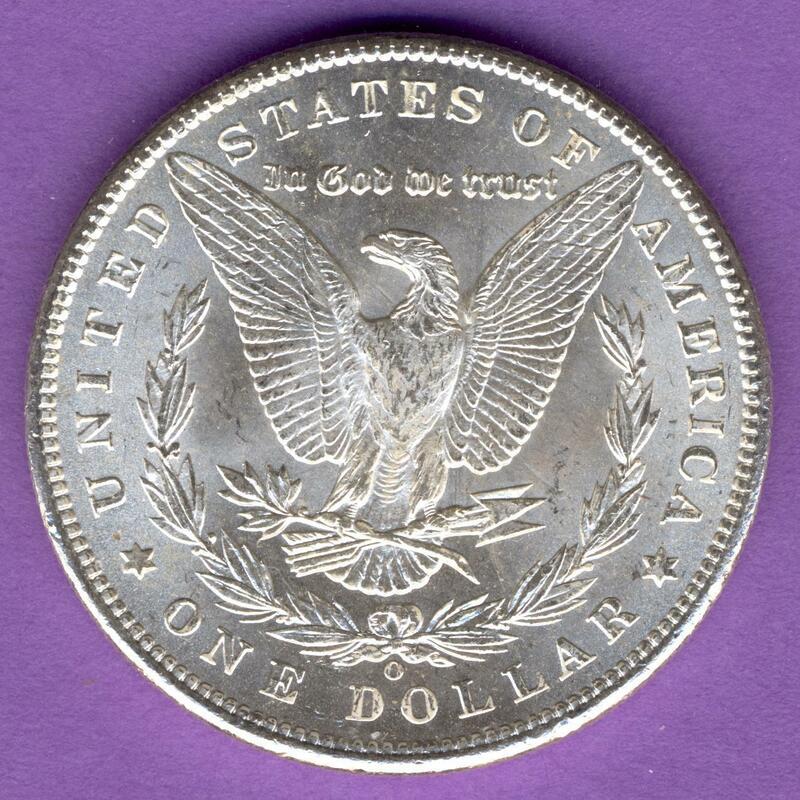 Comments: 1898-O VAM-16 shares the obverse with VNC-5.